The ASEAN Intergovernmental Commission of Human Rights (AICHR) organized the first-ever AICHR Judicial Colloquium on the Sharing of Good Practices regarding International Human Rights Law from 13 to 15 March 2017 at the Sheraton Imperial Hotel, Kuala Lumpur. The Colloquium was jointly organized by the AICHR-Malaysia, AICHR-Lao PDR and AICHR-Thailand, with the support from the ASEAN-U.S. Partnership for Good Governance, Equitable and Sustainable Development Security (ASEAN-U.S. Progress), Regional Europe-ASEAN Dialogue Instrument, Human Rights Facility (READI, HRF), Heinrich Böll Stiftung Southeast Asia, Raoul Wallenberg Institute for Human Rights and Humanitarian Law and the Human Rights Commission of Malaysia (SUHAKAM). The Keynote Address was delivered by His Excellency (H.E.) Dato’ Ramlan Ibrahim, Secretary General of the Ministry of Foreign Affairs of Malaysia, on behalf of H.E. Dato’ Sri Anifah Haji Aman, Minister of Foreign Affairs of Malaysia. H.E. Dato’ Ramlan highlighted that AICHR should actively devise methods and strategies to be the human rights standard-setting institution of ASEAN, and that it is necessary for the region to have a common baseline on how the rights in the ASEAN Human Rights Declaration (AHRD) are to be defined and implemented, as this will accelerate ASEAN’s political, economic and social and cultural development. The Right Honourable Tun Arifin bin Zakaria, Chief Justice of Malaysia delivered the Opening Statement. The Chief Justice of Malaysia shared the history of the Council of ASEAN Chief Justices (CACJ), and observed that there are opportunities for judicial cooperation between the CACJ and AICHR in terms of sharing technical expertise and good practices on human rights matters which are of interest to both; in particular, on the rights of children, women and persons with disabilities. H.E. Edmund Bon Tai Soon in his opening remarks highlighted that the AICHR’s Terms of Reference (TOR) provides sufficient mandate to establish institutional links with the ASEAN Sectoral Bodies to mainstream human rights across the three pillars of ASEAN Community namely the Political-Security Community, Economic Community and Socio-Cultural Community. H.E. Edmund Bon also suggested that there is a need to establish an inter-sectoral expert or working group on human rights and the Judiciary, or a regional resource centre to provide technical expertise and assistance to policymakers, judges and lawyers, or collaboration through the publishing guidance notes or comments on the interpretation and application of the AHRD, and making recommendations to enhance rights protection. The Colloquium was attended by Representatives of AICHR, Senior Judges, representatives of Public Prosecution and Attorney General Offices, ASEAN Law Ministers Meeting (ALAWMM), ASEAN Senior Law Officials Meeting (ASLOM), ASEAN Senior Officials Meeting on Social Welfare and Development (SOMSWD), ASEAN Commission on Women and Children (ACWC) and ASEAN Committee on Women (ACW) from ASEAN Member States. Also in attendance were international judges, representatives of the Office of the High Commissioner for Human Rights (OHCHR), United Nations Development Programme (UNDP), Southeast Asia National Human Rights Institution Forum (SEANF) and Civil Society Organisations with consultative status with AICHR. The Colloquium concluded with the adoption of Colloquium’s Conclusions and Recommendations for the consideration of the AICHR. Amongst the key recommendations were the need to conduct capacity building programmes for the judiciary and to provide technical support, obtain information, develop common approaches and sharing of good practices on human rights. The Colloquium also emphasized the need to compile a regional reference guide in respect of the AHRD and relevant international human rights instruments. 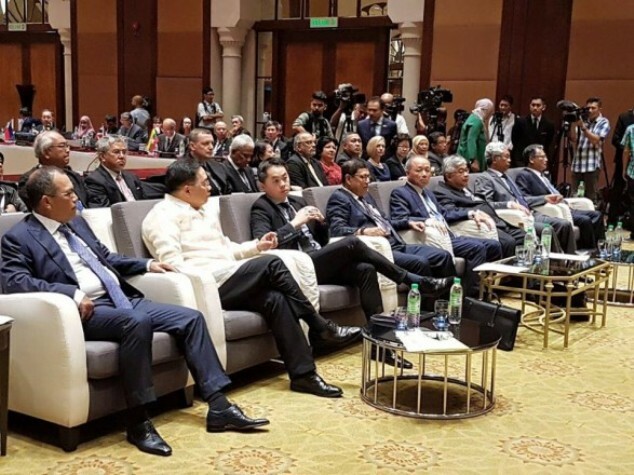 Where appropriate, it was also suggested for the AICHR to further consult and collaborate with relevant ASEAN Sectoral Bodies, and other entities including the CACJ, ASEAN Law Association (ALA), members of CSOs as well as other international and national organizations.